A young girl informed by classmates she could not achieve her dream of becoming a firefighter has been given a VIP tour of a fire station to prove them wrong. Five year-old Grace, from Ilkley, West Yorkshire, was told by her peers that "girls can't become firefighters". On learning of her dream, crews at the town's station gave Grace a tour on International Women's Day to teach her that her dream was achievable. Mother Frankie said Grace compared the job to being "a real life super hero". The comment was made to Grace during a careers day event at her pre-school with a number of invited guest speakers. Her mother said: "One week the fire service came and she was so excited. "As part of the visit they asked the class who wanted to be a firefighter - and she was among those who put up their hands. "Then another little boy said she couldn't be [one] because she wasn't a man." "But Grace wasn't going to be defeated by such a comment and was quick to stand up for herself." Grace was given a tour of the station earlier and met firefighters Danielle Whitham and Emma Hawthorn who showed her the fire engines and fire and rescue equipment. Deputy Chief Fire Officer Dave Walton said: "The women we employ have passed the exact same tests as the men and are just as capable of doing the job of a firefighter." 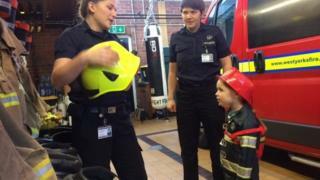 Mother Frankie added: "If it inspires her to want to go on to pursue a career in the fire service, I'd be very proud. It's an incredibly brave job - she sees it as being a real life superhero." West Yorkshire Fire and Rescue has 61 operational female firefighters, making up 5.5% of its operational workforce.